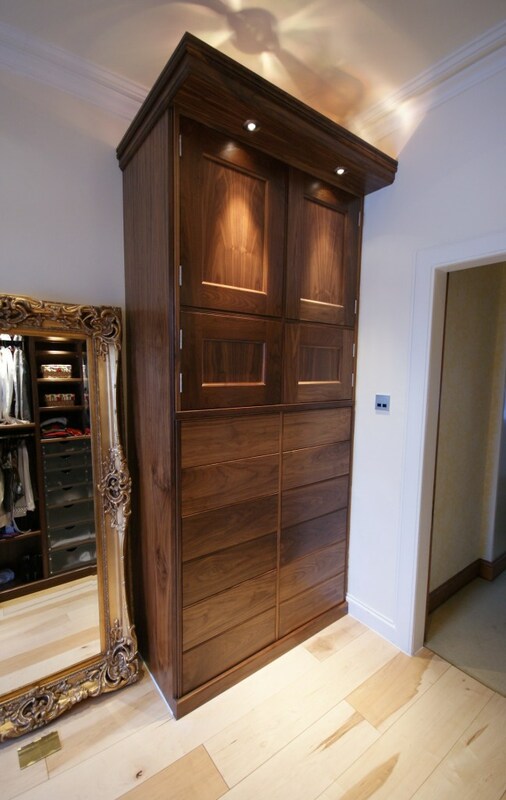 Simon Fowler Woodwork can build bespoke dressing rooms, slide show example opposite shows a small room dressing room constructed using walnut, with tempered glass faced drawers. 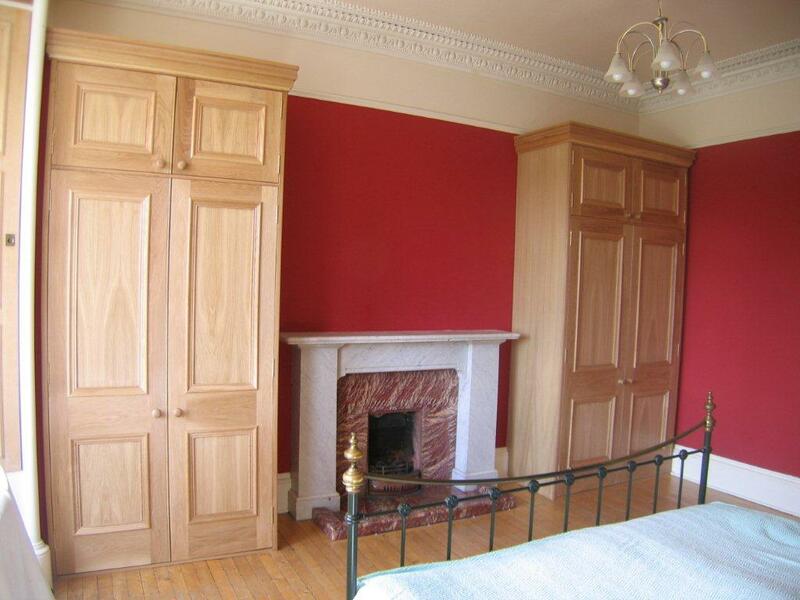 Other wood finishes & materials for painting can also be used to suit own personal tastes. 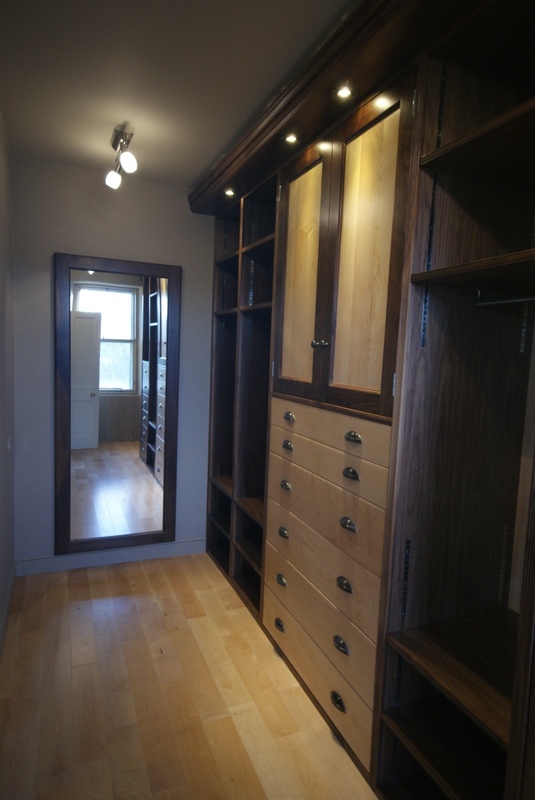 The shown dressing room incorporates pull down hanging rails to make best use of available space, there is also a curved corner finishing up to window area, with storage shelves & drawers units present with wardrobe structure. 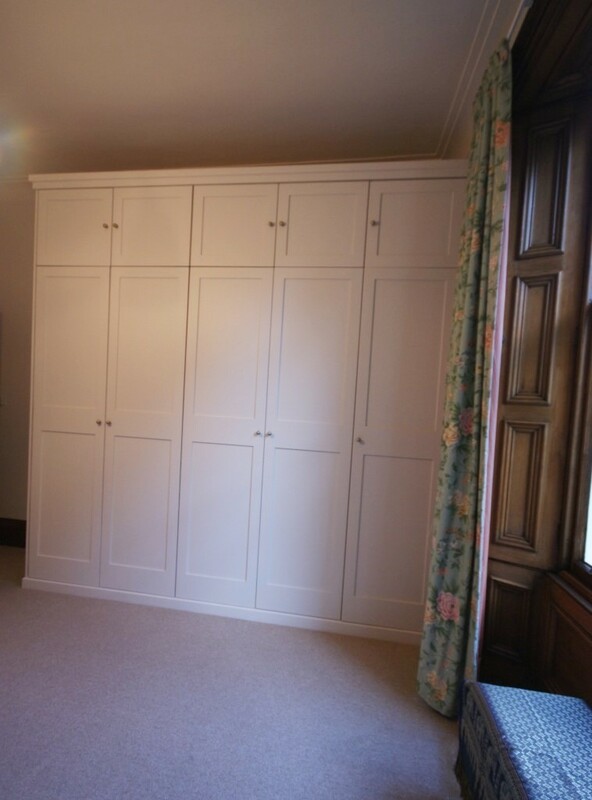 A separate drawer & storage unit from main wardrobe area was also requested by client, incorporating touch release mechanism catches to drawers & doors without need for use of handles. 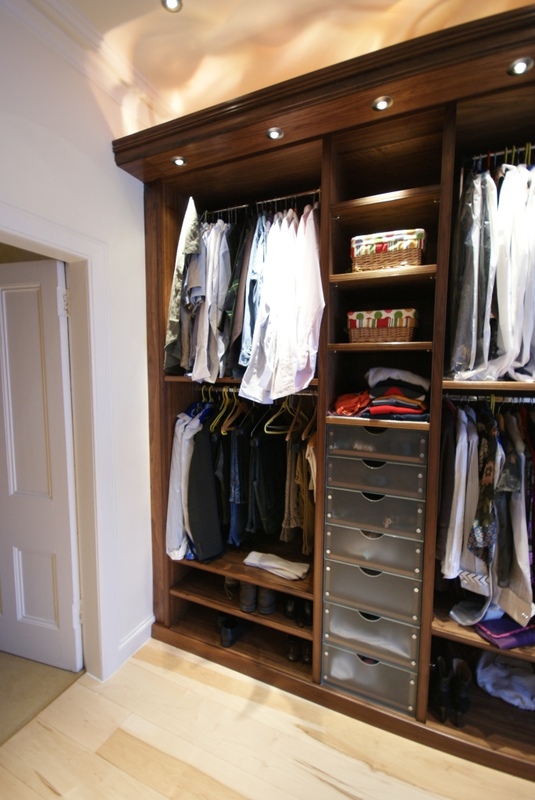 Overhang pelmet lighting is used to provide maximum light when using wardrobe. 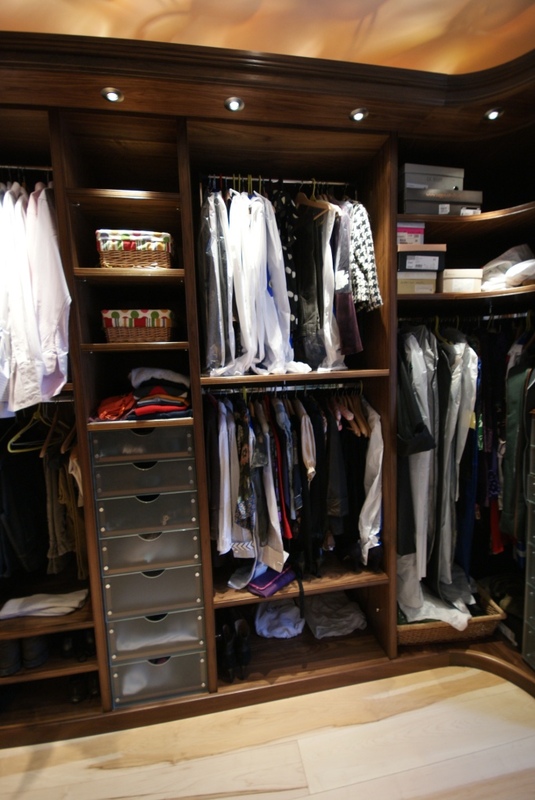 Below are just a few photos of past completed wardrobe work, if you click on item, they will open then display fully in larger frame. Should you have a query regarding any of the images, please quote image number within your email enquiry. 1. 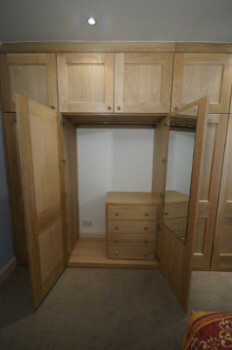 Above shows a walnut dressing room/walk in wardrobe with hanging areas, glass fronted drawer units with walnut interior drawer linings, and separate storage cupboard unit with lower part fitted with push to open drawers. Overhang lighting was also provided. 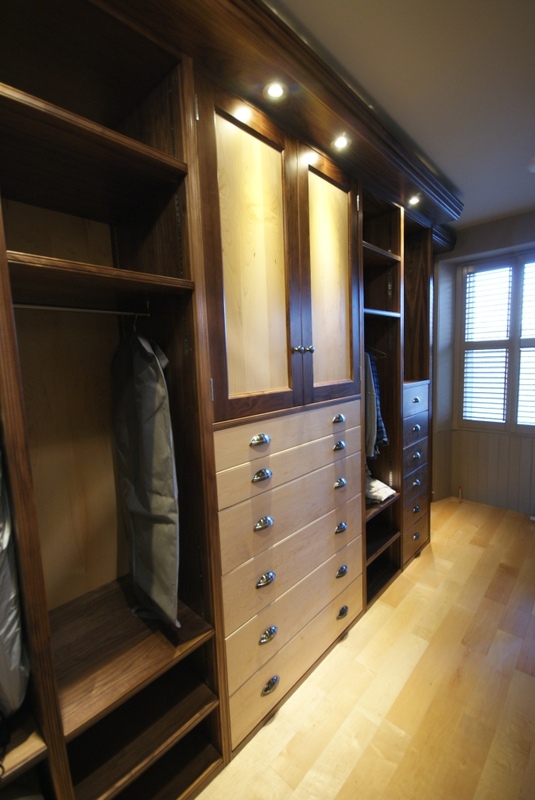 This could also be constructed in different wood finishes. 2. 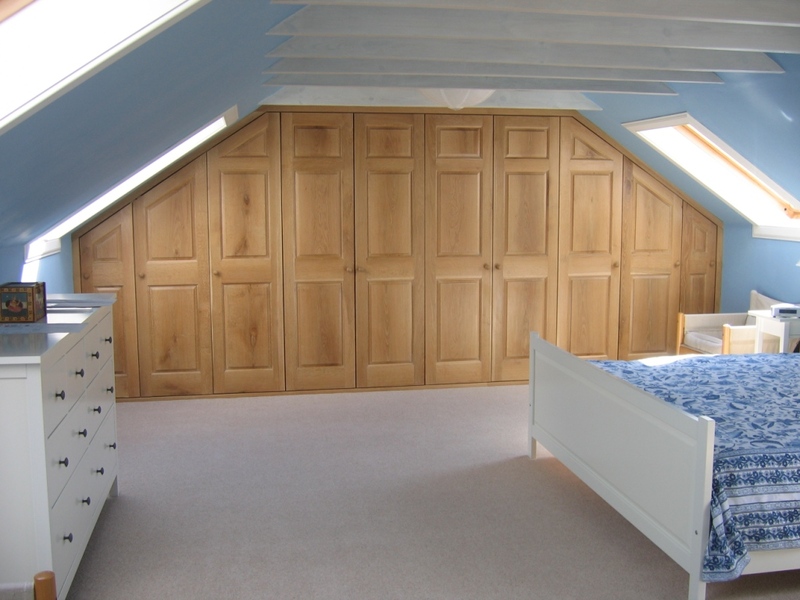 Oak fitted bedroom wardrobe within attic pitched roof conversion. 3. 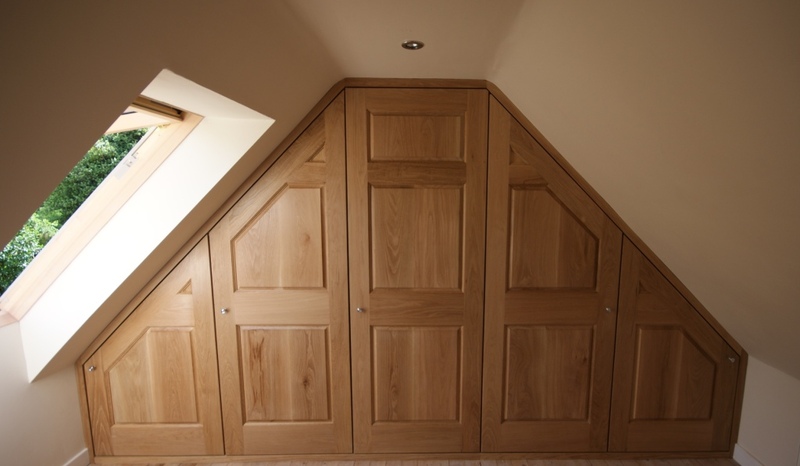 Oak fitted bedroom wardrobe within pitched roof space. 4. 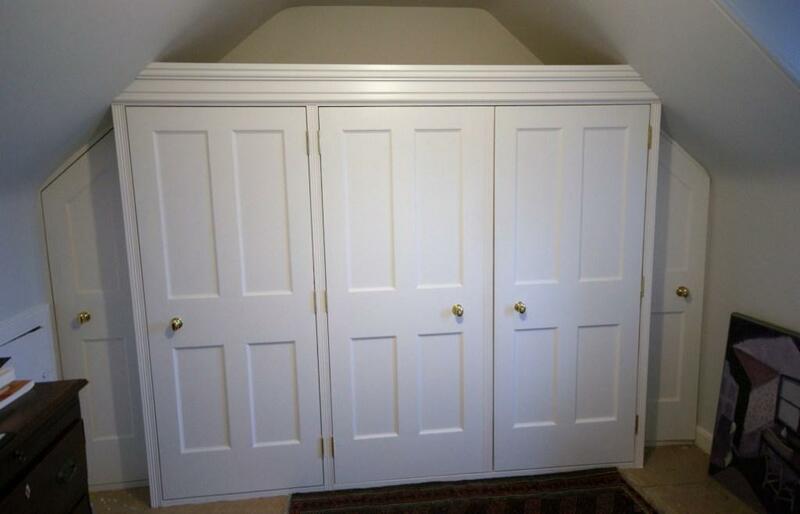 Painted fitted bedroom wardrobe within pitched roof space. 5. 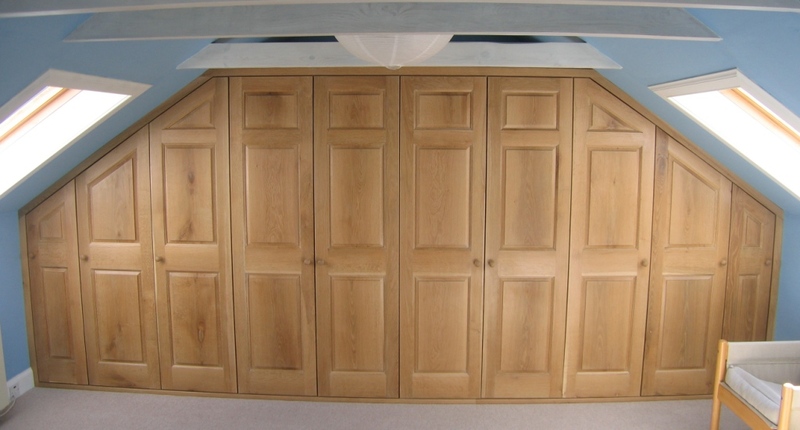 Above shown is a pair of oak bedroom wardrobes. 8. 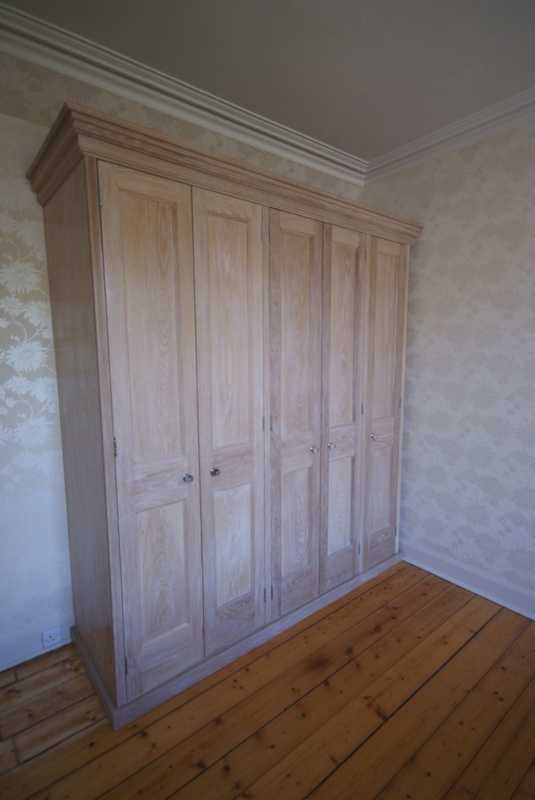 Above shows limed wax finished wardrobe, internal of wardrobe was fitted with a combination of full/split hanging space, complete with drawers & some shelves. 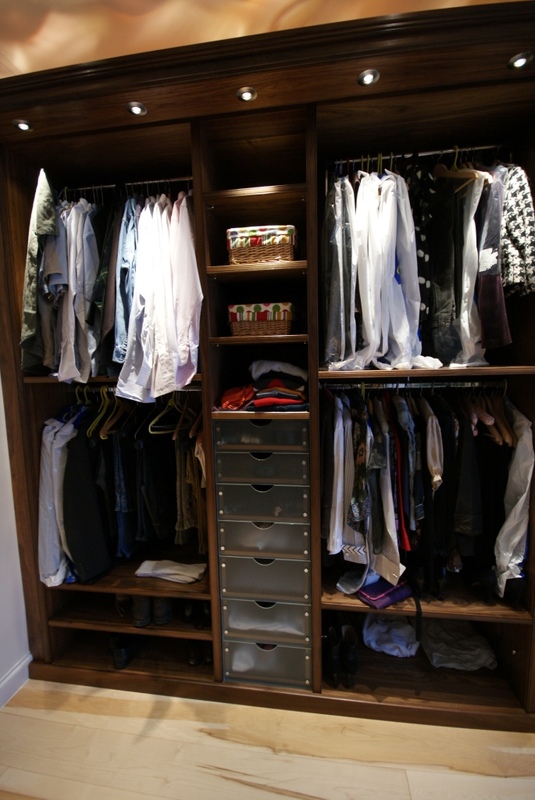 Wardrobe could be constructed from different timber finish or spray painted. 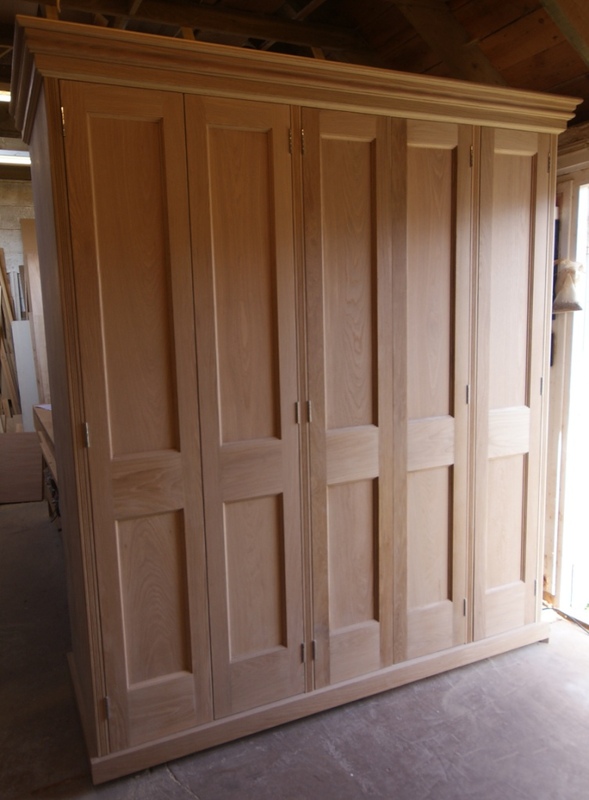 The last picture shows unfinished wardrobe at workshop. 9. 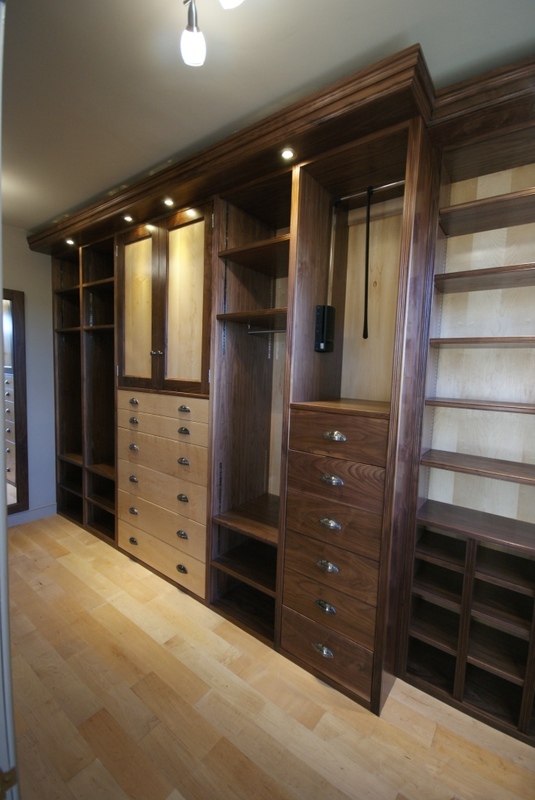 Above shows walnut & maple dressing room, constructed using space of smallish room adjacent to master bedroom to best possible use, consisting of hanging space, including pull down rails, shelves, cupboard, drawers, shoe storage box unit, and mirror. 10. 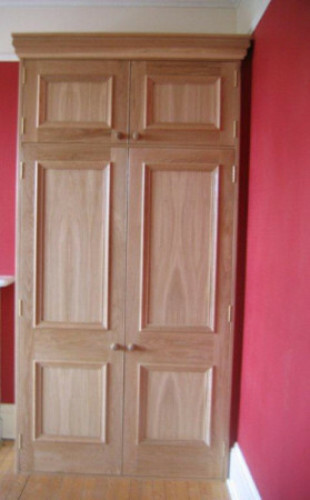 Painted shaker style fitted wardrobe. 11. 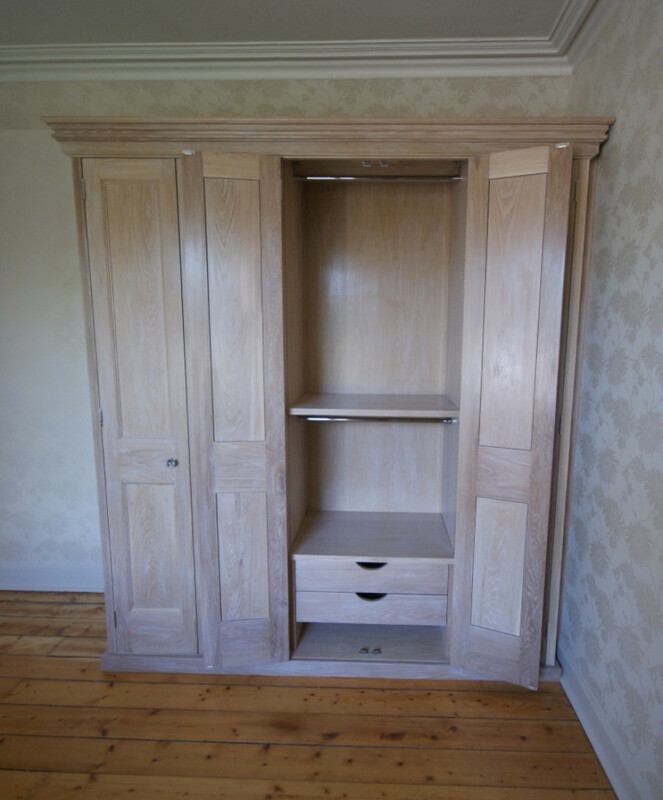 Above shows oak wardrobe & drawer unit. 12. 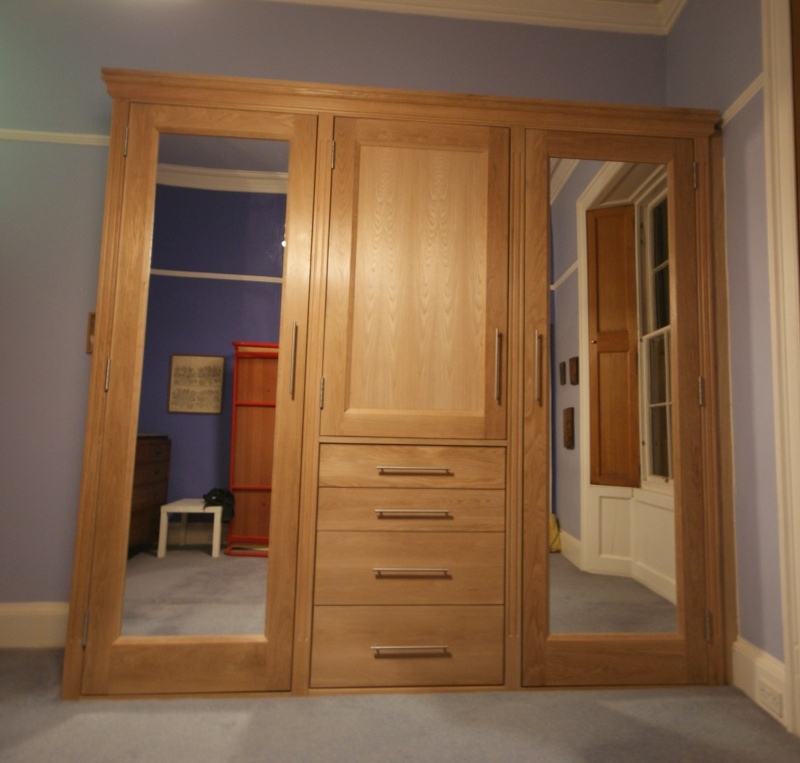 Light oak traditional style wardrobe. 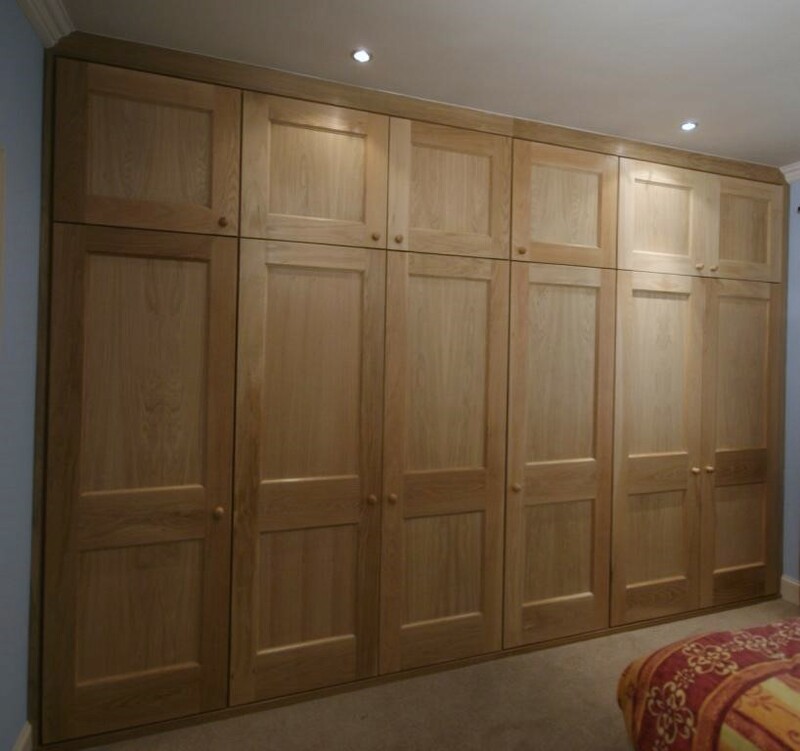 Simon Fowler Woodwork can also build bespoke wardrobes to fit within sloping ceiling top floor rooms or attic conversions, a couple of examples opposite are shown constructed using oak, but can also be constructed using other wood finishes or materials for a paint finish to suit personal tastes, & overall cost budget requirements.